Can you believe it's time to start thinking about Easter? Is it just me or does time seem to be flying by even faster than usual this year? Well, you know what they say...time flies when you're having fun. I guess that means my 2014 is off to a good start! I hope yours is too! 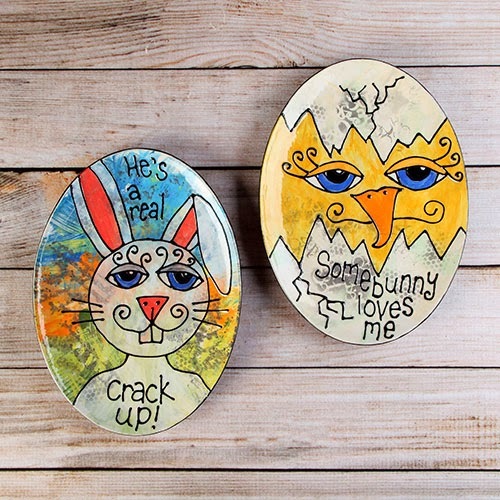 I was thrilled when the iLoveToCreate® folks asked me to make a ceramic project for Easter to blog about. I knew right away I wanted to make something with the Duncan® Oh Four® egg shaped (technically they are oval but we'll say they are egg shaped this time because it's appropriate for Easter) platters. My style of art is generally very whimsical and silly, so I decided to apply the same style to the platters. I used Duncan Cover Coats® , French Dimensions™ and Pure Brilliance® along with some rubber stamps and stencils to create these. Then, I dug deep into my sense of humor to find my favorite Easter puns and added them to the plates. These were really fun to make because my favorite subjects for my art pieces are animals. I can't say I've ever painted a rabbit or a chick on ceramics before, so the project really broadened my horizons. Now I can't wait to pile these up with food for Easter and see what people say when the food is gone and they see these crazy characters staring back at them! I hope you enjoyed this project! If you'd like to see more of my ceramic creations, you can visit The Peculiar Palette, my personal blog.